This arcaded oasis is Barcelona’s only square designed as a set piece, and the only one ‘twinned’ like a city, in this case with Plaza Garibaldi in Mexico City. It replaces a Capuchin convent that had the dubious distinction of being the first to be burned in the first church-burning uprising, in 1835. This was sparked by a disappointing bullfight held to celebrate Queen Isabel II’s birthday. The angry crowd dragged the last dying bull to the Capuchin convent, where orators whipped the bystanders into a frenzy with tales of wicked plots by Carlists and priests. When the rubble was cleared, the land was auctioned off and Francesc Daniel Molina won the competition to design the square, in 1848. He enclosed it in harmonious neoclassical residences that contained shops and cafés on the ground floor; it was modelled after Madrid’s Plaza Mayor and decorated with terracotta reliefs of busts of great navigators and discoverers of America. 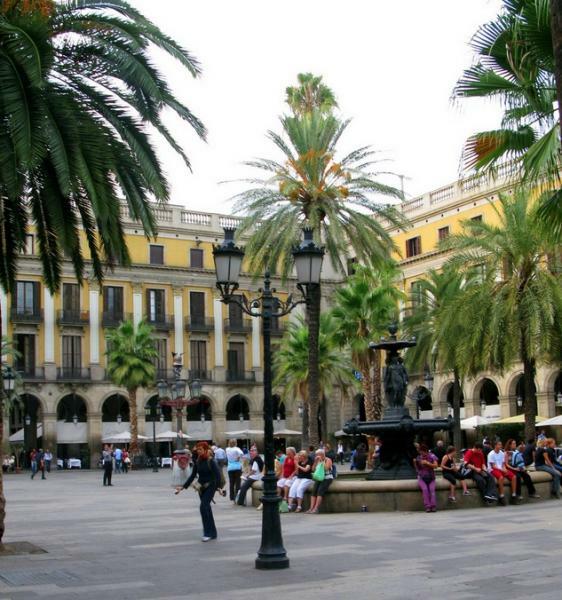 After hitting rock bottom as an outdoor salon for muggers, addicts and prostitutes, Plaça Reial was given a face lift in the early 1980s and planted with tall palms. Yet even in its most desperately grotty era the square hosted a Sunday-morning stamp and coin market, as it does still. The palms chaperone the late 19th-century iron Font de les Tres Gràcies splashing in the centre and two flamboyant Modernista lamp-posts. These are Gaudí’s earliest known works (1878), designed in his student days and covered with emblems of Hermes, the god of commerce. The square retains a bit of its 1980s raffish edginess; street musicians, tourists, eccentrics, narrow-eyed chancers and wide-eyed backpackers all gather on the café terraces to watch the world go by. Benches by Oriol Bohigas, Barcelona’s grand poobah of urban design, allow space for only one bottom each. In the Plaça’s northeastern corner, the Café-Restaurant Taxidermista was once filled with stuffed animals instead of stuffed tourists – now it is just the average, minimalist design bar. Dalí, who once ordered 200,000 ants and a rhinoceros, was one of its best customers. One shop that has survived intact is just a step away in C/ del Vidrea: the antique Herborista del Rei, founded in 1823 and still selling teas and soaps under the watchful eye of a bust of Linnaeus.